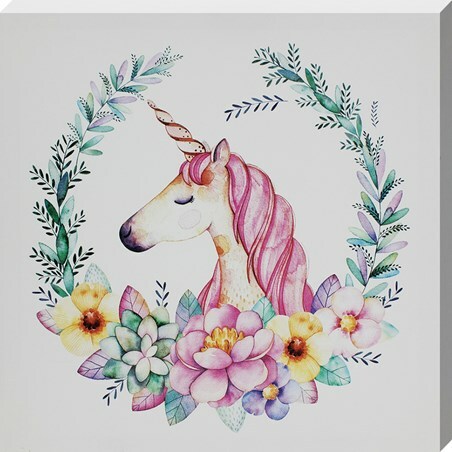 If you're looking for that elegant touch with a hint of fantasy to really make your home yours, then this enchanting unicorn wreath canvas print is surely the perfect piece for you! Surrounded by colourful blooms of pink, yellow, green and purple, this peaceful mythical creature sits proudly inside. Finished with delicate watercolour to add a little texture, there's no doubt this design is going to bring the magic straight to your door. High quality, framed Unicorn Wreath, Sprinkled blooms of Magic canvas print with a bespoke frame by our custom framing service.